Located in London's Stoke Newington, Coban has been designing premium, contemporary clothing for men since they were established in 1990. 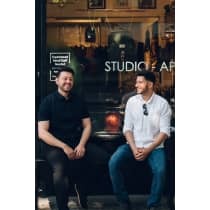 Almost thirty years on and the boutique now features apparel alongside lifestyle products and accessories from both its own and other like-minded brands, sourced by owners Mahmut and Yalcin. "We developed our own menswear line 'Life in Paradigm' because we noticed a gap in the market for simple, classic design at an accessible price point. We have a design studio in house, which allows us to have full creative control and tailor the collection to our customer needs."